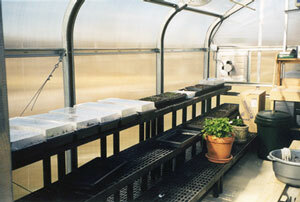 The Garden Grower greenhouse is a commercial quality, steel frame hobby greenhouse. This shade cloth kit is sized to perfectly fit the various sizes listed above. It includes everything required for complete installation. Custom fit for greenhouse sizes in drop-down box above. Constructed of high density polyethylene, the tough lock-stitch design of this knitted material resists rips, tears and fraying while reducing wind speed and heat build up in structure.